A spooktacular event for kids 10 and younger at the I-X Center October 22&23 and October 28-30! Bring your kids in costume and Trick or Treat your way through 12 themed candy stations, then test your swing in a game of Ghoulish Mini Golf. Ride ponies, eat great food, and enjoy the fun amusement rides and attractions! Special guests Scooby-Doo & Shaggy, Bugs Bunny and Daffy Duck, and the Tenny Shoe-Bop Bunny Band will appear on select weekends. 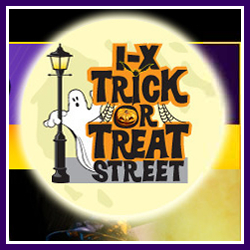 Visit www.ixtrickortreatstreet.com for entertainment schedule and to purchase tickets in advance.